If you have followed me for any amount of time, then you know that I started this little business of mine by picking up furniture that people were throwing out and making it pretty again. 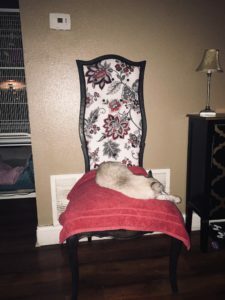 Well when my new favorite client Deanna contacted me on Facebook about this chair she rescued from the trash more than ten years ago I was intrigued. She isn’t pretty here…but just you wait! A star is about to be born. 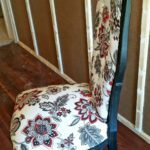 A vintage upholstered chair was getting a makeover! Taking this chair on was a little daunting for me because up until now I only had three decent upholstery jobs under my belt. They all came out fabulous but I was a little unsure if I could pull it off. 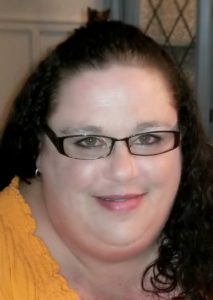 But thanks to the communities on Instagram and Facebook and the willingness to share information, I got all the guidance I needed to give me the confidence that I could do it! Taking this one down to the base was challenging. Not removing the fabric, but getting all the staples and tacks out that had been used. It took me close to three days to get them all out. But I got a pleasant surprise when I started stripping her down. 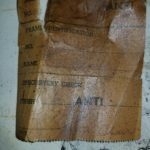 This little ticket was tacked to the inside frame of the chair. I had a friend who has an antique store look into it. 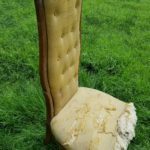 It appears that this chair was custom made in 1902!!! I couldn’t believe it. Over 115 years of history in my hot little hands. I had to make it fabulous. 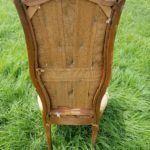 The original plan for the chair was to paint the frame, but if I had done that, it would have covered up all of this beautiful hand carved detail I uncovered once I stripped someone else’s paint job away. I called Deanna, and she said simply, that she trusted me and to go with it. That was all I needed to hear. I hand sanded every single little detail. As the years got stripped away to what she originally was I was just in awe. I couldn’t wait to get her made over! 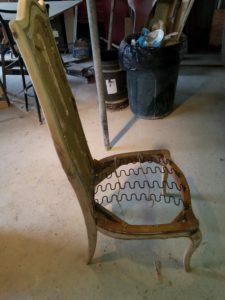 There was an old school spring seat on this one, which consisted of four wire coils, mounted in brackets with tacks, then strung with utility cord to maintain their bounce. I had to have one mount machined for one of the springs that had broken, and we had to restring the springs. They were nice and tight again. Next the frame of the chair got a nice coat of Minwax Ebony Stain. I just rubbed it into the wood of the frame. 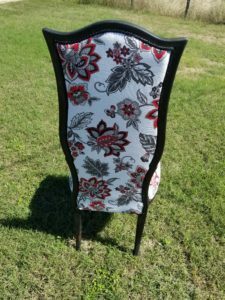 My customer had already picked out a beautiful fabric, so I just reinforced it with backing to make it tougher. 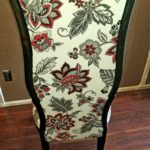 You have to do this if you use regular fabric on upholstery so that it doesn’t tear when you use the chair. 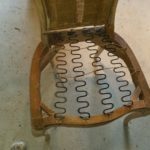 The chair got new fill, and then the fill got covered with banting. I just use simple quilt banting. It basically is just to cushion against the coarseness of upholstery fill. The only real challenge was getting the fabric and banting into the little channels. But once I ordered a pneumatic upholstery stapler, it went off like gang busters! Buttons were added before I covered the back of the chair. Then a screen over the bottom of the chair and it was ready to be corded. I used a fabric adhesive that dried clear to add a beautiful silk cord around the channels. 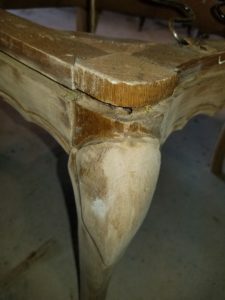 It isn’t often that I come across a piece I don’t want to part with. But this chair was one I definitely didn’t want to give back. While I was working on her at first I called her “The Belle of the Ball” or Belle for short. But by the end I was calling her “The Queen of Hearts” because she most definitely stole mine! Deanna made me feel amazing though on the night that I delivered her. There were tears and I made sure I got visitation rights…lol. Deanna’s cats love her too! She sends me pictures often, and I have already agreed to take on several other projects for her. 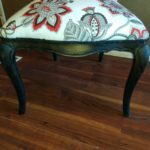 I have a lifelong client and friend now and more confidence in upholstery, which I am kind of digging now. I have a cowhide job coming up soon for an attorney’s office, and I can’t wait to undertake it! I hope you enjoyed seeing “Belle’s” journey as much as I enjoyed walking it! Just proof yet again, that if you believe in yourself, and use the resources around you…anything is possible! I will see you guys soon with the reveal of my coffee bar! You can watch me playing around live with the design here. Be sure to like my page while you are there so you can see what it coming down the road ahead and get all of my tips and tricks. 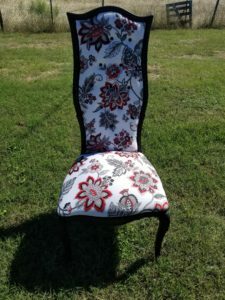 What an awesome chair makeover! Wow! I’m truly impressed with the before and after of “Belle”. You work hard and the end result proves that. Thank you for sharing. I am so glad that you enjoyed her journey! It was a pleasure to get to bring her back to life. Well thank you! 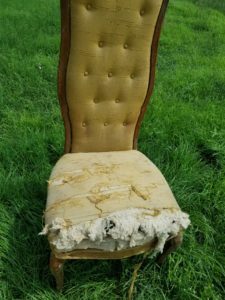 The history of this chair is amazing. My client should be very happy I like her….because me and that chair could have disappeared…lol! OMW she is sooooooo incredibly beautiful now. From the top of her lovely crown all the way down to those elegantly curved legs. No wonder your client and friend was brought to tears. You did a stunning job.